Unfortunately, as cool as the Triumph Bobber looks, it's not been plain sailing over the first 3000 miles we've spent together. I've chucked the Bobber straight in at the deep end, using it as my main form of transport everyday, no matter the weather or distance that needs covering. This has lead to small bits of corrosion around the brake discs already, and then there was my battle with the oil filler cap. But even more annoying than these two small issues was the right mirror breaking one morning. I removed the bike cover one morning to find the right hand mirror pointing down. As I went to return it to its normal position it moved much more freely than normal and on the way into work wouldn't stop wobbling about. Once I got to work it became clearly it was knackered as something could be heard rattling around inside the mirror. 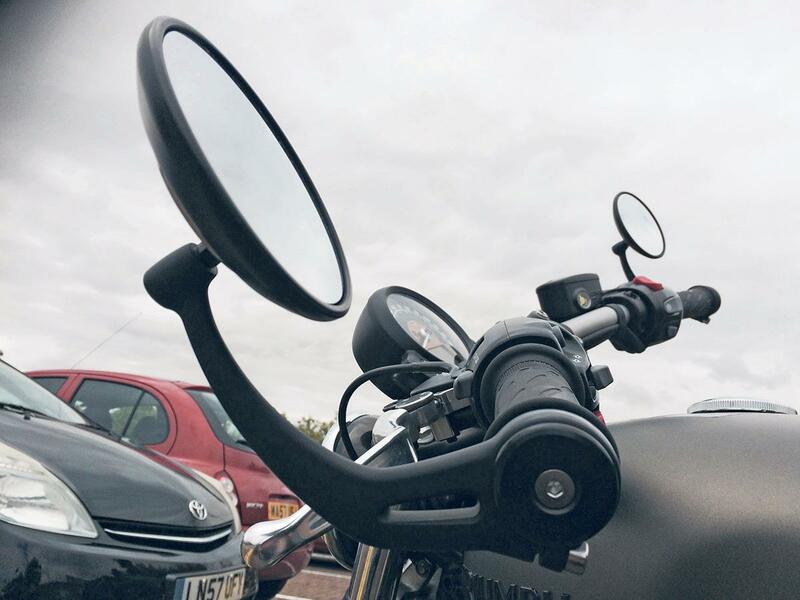 I contacted Triumph who reassured me the mirror would be replaced under warranty (£47.59 including VAT otherwise) and popped a new one in the post for me to fit. Since the mirrors on the Bobber are bar end mirrors it was just a case of loosening two allen bolts and sliding the original item off - no messing about trying to remember which way the threads go on standard mirror stems. The replacement mirror has held strong so far and it's nice to have a full view of what's behind me again.